Hospitals that utilize a valet parking system are taking advantage of an outstanding public relations tool. Hospital valet parking will improve a facilities patient satisfaction scores, as well as amplify the status of the facility. A Valet Attendant is typically the first and last point of contact for patients and visitors at your healthcare facility. Our valets strive to create a five-star hotel-like environment by warmly welcoming patients and visitors, opening and closing vehicle doors, assisting with wheelchairs, walkers and oxygenated equipment, as well as helping with any baggage. Additionally, our valet parking attendants provide directions and assist patients and visitors with physical limitations. 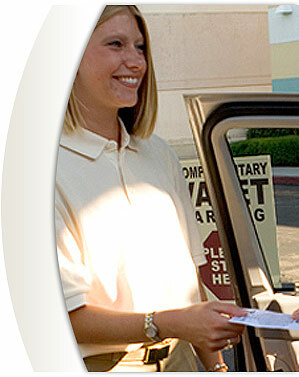 Our valet parking team handles every situation in an efficient, business-like manner that instills trust and respect. Our professionally-attired, screened, fully-trained and courteous valets place patients, visitors, staff and physicians as their top priority, treating them and their vehicles with the utmost care and respect. Adhering to Hospital Parking Management's core values, our valets complete their daily tasks with pride and enthusiasm. Whether assisting a wheelchair patient, giving directions or attending to a patient's vehicle, our valet team handles every situation in an efficient, business-like manner that instills trust and respect. Our professionally attired, fully-trained and courteous valets place your patients, visitors, staff and physicians as their top priority, treating them and their vehicles with the utmost care and respect. A Valet Attendant is typically the first person your patients, visitors, staff and physicians interact with upon arrival at your healthcare facility. Our valets strive to create a five-star hotel-like environment at your healthcare facility by warmly welcoming visitors, opening and closing vehicle doors, carrying baggage, providing directions to any point within your healthcare facility's campus and assisting visitors with physical limitations or wheelchairs. After carefully parking the vehicles, our valets inventory and safely store the keys for quick retrieval when your patient, visitor or staff is ready to depart. Our valet attendants go through the Hospital Parking Management's HPM-IT training program which was designed to educate individuals working at healthcare facilities within JACHO and HIPPA regulations. The training program also stresses our corporate philosophy of customer service, which is simply to exceed the expectations of our clients, their patients and visitors on a daily basis. Read more about our hospital valet parking traning program for our hospital valet parking attendants by reading the HPM-IT page.